b) just leave a comment below with the stuff you want bla bla. Your comment will not be shown publicly! No matter how you do it, we will get back to you immediately with a total and a wisely calculated postage rate and your estimated delivery time, depending on your position on the terrestrial globe. Wholesale inquiries, general questions, you just want to say hello I love/hate you? Please follow the same procedure! Any item listed in one of our shops SHOP1@discogs.com or SHOP2@ebay.de can be ordered directly from us as described above, you don’t have to bother with Discogs or eBay, in case you don’t run an account there. Just write us what you want and we take it down for you. After all feel free to order via Discogs or eBay directly, if this is more your kind. Any item listed is actually in stock and ready to ship! 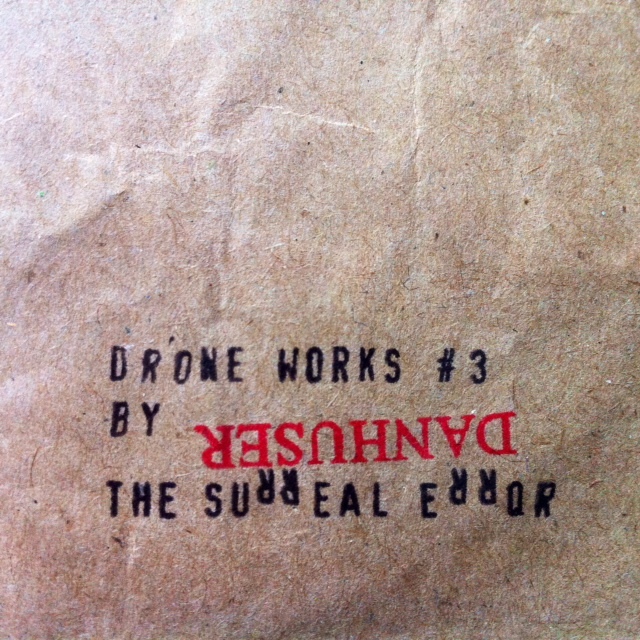 The Surreal Error “Drone Works #3” (CDr) – 1st Edition ready for pre-order! © Danhuserecordings 2014 – Cat.-Nr. : DR 07 – Limited/Unlimited to 23 copies! Remaining copies will be sold for 6 EUR only + shipping.